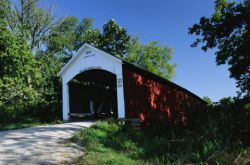 Indiana facts and history plus travel and tourism information. Indiana means "land of Indians," a reminder of the many Native Americans who lived on the land before "Hoosiers" became the more common name for Indiana residents. No one knows for sure where the nickname "Hoosier" came from, but there are many theories. Indiana became the 19th state on December 11, 1816, and has since become a major player in the manufacturing and agriculture industries. Indiana companies produce auto parts, steel, electronics, medical equipment, chemicals and more. In flat northern Indiana and on the rolling hills in the southern part of the state, farmers grow corn, soybeans, and hay and raise pigs, dairy cows, and chickens. Indiana is home to three nationally distinguished educational institutions - Purdue University, Indiana University, and Notre Dame. Indianapolis, the capital city, lies in the center of the state and hosts the famous Indianapolis 500 race. Other attractions include the Children's Museum of Indianapolis and the Indiana Dunes National Lakeshore along Lake Michigan.